Lent is a penitential season during which God’s baptized people celebrate their Baptism through repentance and faith in Jesus Christ. Jesus is the true and only Savior, the one foretold by God’s prophet, and the only one who can restore humankind to a relationship of life with God through His suffering and death. Stay in God's Word every day during Lent with Places of the Passion Daily Devotions. The scenes of Lent are familiar. The upper room, the garden of Gethsemane, the halls of Pontius Pilate, and the hills of Golgotha. These are the places we remember when we meditate on our Lord’s passion. 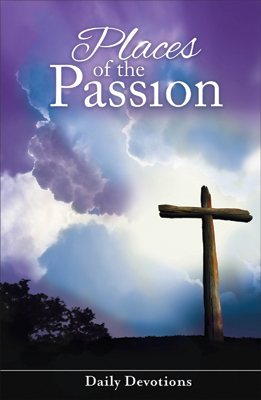 When Jesus enters these Places of the Passion, He never leaves them as He found them. He transforms each into a place of hope, wonder, and salvation. Yet these are not the only places that the Lord enters. The most troubling places of our lives become the most amazing places of God’s grace when Jesus visits them. In these daily devotions, we meditate on the places where our Lord finds us—places that are sometimes dark, lonely, and even frightening. We will gaze in wonder at the spiritual work our Lord does in our lives. Jesus will share His strength in our times of weakness. He will fill us with His praise in the midst of our sorrow. Day after day, we will discover our Lord . . . waiting for us . . . willing to share with us a love that was set in place before the foundations of the world.